I’ve always hated girls. The pretty pretty princess play of the girls in my neighborhood could never compare to the games of street hockey and dressing up as a Teenage Mutant Ninja Turtle with my childhood best friend, Eric. To say I was a tomboy would be putting it EXTREMELY mildly. I was the 7-year-old who teachers knew to keep separated from a particular boy … because we would physically fight when in close proximity. The 10-year-old who had a royal FIT when I was cast as the princess in the school play. Who wanted to wear a gold dress and faint when there were sword battles to be had? The 15-year-old who kicked a boy when he dared to suggest a girl couldn’t play soccer. So imagine my surprise to find myself ears deep in a community of thoughtful, intelligent, hilarious, caring WOMEN. I don’t know if it’s that I’m finally becoming compatible with women, or that APW attracts ladies who think the same way I do … I like to think it’s a little bit of both. But it constantly amazes me that I have this awesome network of women … those that I have met and those that I’ve gotten close to online … who I can relate to, share with, laugh with, fight for, and support … women I LIKE. Women I can jump on a bus … or drive 400 miles … to see, be sure of a couch to crash on, and know, without a doubt, we’re going to get along BETTER than we do online. Women I can count on for a happy hour, for a good conversation, for sympathy and closely kept secrets. And if the last couple of meet-ups have been any indication, there will always be at least one new lovely worth keeping each time we all get together. So … Team Practical … and all the women who’ve always been on Team Sarah (whether I’ve acknowledged it or not) … thanks. I love you all. There’s a couch and a cold beer waiting for you, whenever you want it. Just say the word. Awww. It is a wonderful community, no? I think that APW attracts a lot of (but not exclusively) women who were the girls-who-hated-girls growing up. The scrappiness that marked me as a tomboy when I was a kid has made me into a pretty confident woman, so I’m grateful for it. And the APW community? 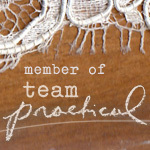 Yeah, there’s a love letter to Team Practical in my head too. Small small SMALL world. Do you read APW, too? Hells to the yeah! I love APW!! Hells yes. I ditto this.